I got this fun and easy idea from one of my new favorite blogs, I Can Teach My Child. 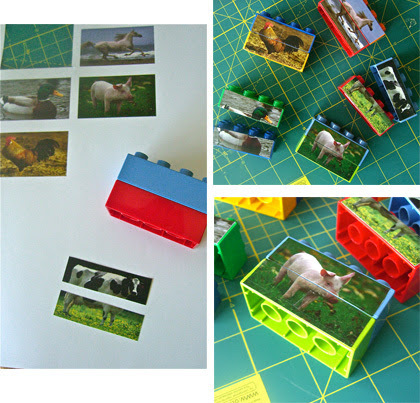 She has so many great activity ideas for small children, I decided I needed to try her Animal Mix-Up Legos. This was designed for the Duplo Lego blocks, but would probably work for any pre-school construction blocks in this size with a little adjustment. I went on an image search and found the animal pictures, but you can also go here for the photos she used and her sizing directions. Print photos, cut out, tape to blocks. Easy Peasy. After assembly, just scatter the blocks on the floor and let the fun commence. Jellybean is two. It took a little bit for her to figure this out. Once she did, she loved finding the correct pieces and putting them together. 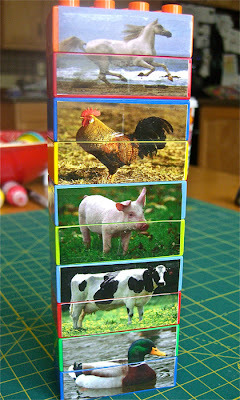 I'm thinking I may print a few more photos and cut them in quarters for the smaller square blocks. That should make it just a little trickier for my four year old. Such a simple idea and so much fun. 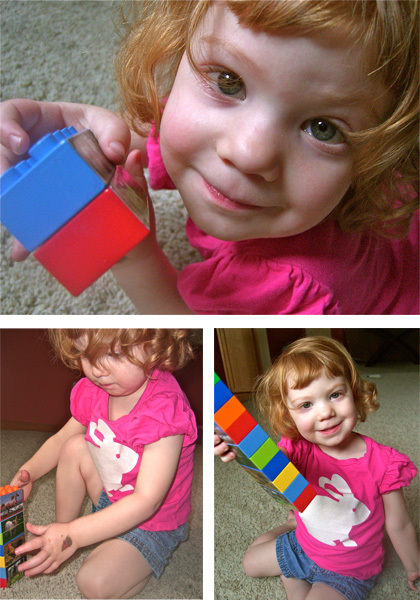 Jellybean has been carrying her puzzle around with her and even taking it to bed at night. She's kind of attached. I also have some good news! I'll be guest posting this morning about my Read With Me Book Bags over at The Practically Perfect Princess. Go check it out! I love it! My little one recieved some duplos for her birthday--I think that I will have to try this out! Thank you so much for linking up at my Teaching Time post! Oh, how fun!! I love it. 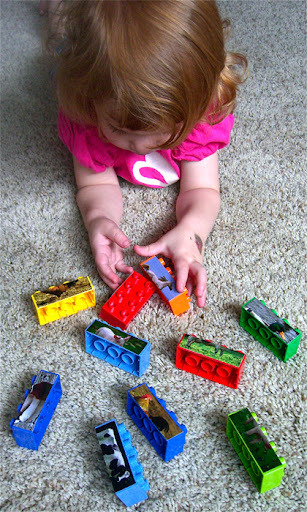 We have magnetic blocks like that, but love the idea of making them with Legos! Thanks for sharing at Sharing Saturday! !